Ski world cup: US wins most medals but does any American care? Tommorrow is the last day of the alpine ski world cup in Schladming but it is already clear that the US won with 4 gold medals. And it did even so without Vonn and Miller. My question now to you is, if anyone even knows of Lindsay Vonn, Bode Miller or Mikaela Shiffrin or what alpine skiing as a professional sport ist to begin with. Re: Ski world cup: US wins most medals but does any American care? Winter sports tend to not get the tv coverage that summer sports get outside of Europe. I personally am really looking forward to next year's Winter Olympics, as it gives me an opportunity to see sports that I wouldn't normally get a chance to see. I haven't seen where it was televised here. I already thought so. And now broadcasting propably also means that most people won't really know it either, right? 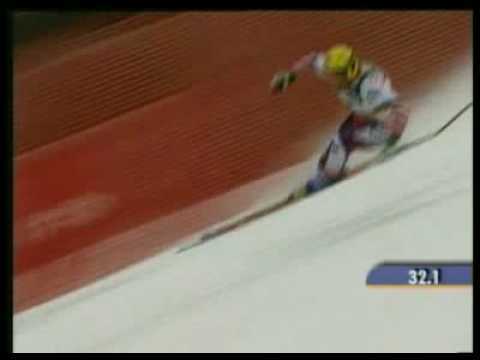 You'd probably have to wait for Winter Olympics 2014 in Sochi for seeing some Alpine sports broadcasted I guess. It this country, it it ain't football, basketball, or baseball, ot golf, it's not a sport. Football reigns. that's where the majority of the testosterone is released. If countries like Iraq, Iran, Egypt and a few others had the same obsession with football that America does, there would be no testosterone left over to fight among themselves. There are some people here in Europe who watch American football btw, at least the Superbowl. Even if that means watching games in the middle of the night. Lindsey Vonn is well known enough. she got injured recently in a crash on the slopes. As OldmanDan alluded to, the sports market is already well saturated by the NFL, NBA, MLB and the NHL. And then college football and basketball is huge. And then theres Nascar. Then theres PGA golf. Its all too much for me. And i only watch the playoffs of the major 3 and maybe some college bowl games. I'll get my winter sports fix during the Olympics. Last edited by Jihad4Beer; 02-17-2013, 11:16 AM. That is starting to change though. Soccer and rugby are getting more and more national attention. Rugby (Sevens), for example, was recently given national airtime on NBC last weekend. That will increase with the 2016 Summer Olympics in which rugby (again, Sevens) will make its return. If it doesn't involve a ball of some sort, it's not a sport in this country. I competed in track and cross country in high school and college. Even in college you could go to a cross country meet where there'd be less than 20 or 30 people watching. Not counting the trainers and squirrels. In my first college effort, I took an archery class for PE. You were not supposed to know much about the sport when you signed up. I signed up because there were lots of girls taking the class. Since I was fairly good with a bow before I took the class, I decided I would shoot left handed to make it appear that I was eligible for the class. All went well til one Saturday when I showed up at the range with my Olympic class target bow deciding to show off a little. I felt a tap on the shoulder. It was my instructor. She gave me til Monday to drop the class. i can't believe wrestlin' is goin' to be eliminated as an Olympic sport. I can. I don't think wrestling has enough of a following. Personally, I never watched it. i see it as a great sport, an elemental one...like swimmin', or runnin'. one 'o the foundation disciplines 'o mixed martial arts. Not arguing that. I am just saying that, apparently, not enough people watch it when it comes to the Olympics. maybe imma just gettin' long in the tooth, matey...or imma just sorta conservative when it comes to this sorta thing. its a celebrated amateur sport in North America...in the Middle East...and in Eastern Europe. even though i stakeboarded as a youth, the "X Games" kinda olympic events look kinda absurd and shallow to me. Celebrated it may be, but apparently it isn't mainstream enough to hold its spot at the Olympics. Still, there are plenty of other events that I think should have got the boot before wrestling. Rhythmic gymnastics? Synchronized swimming? Seriously? As I have said though, it isn't a total loss. Come over to the rugby cult in 2016. I don't follow Alpine skiing too much now that I live in the middle of a desert but as a kid I used to pretend that I was Franz Klammer or Ingemar Stenmark. I certainly know who both Bode and Lindsay are and I still get a rush out of watching the slalom, the super G and the downhill but although my skis are still in the garage I haven't had them on in a dozen or more years. Wow, you know Franz Klammer, that's cool. Do you know Hermann Maier? He has retired in the meanwhile as well but probably was one of the greatest skiers.